Brunei is blessed with an abundance of fossil fuel deposits that has propelled its economy to prosperity. This high-income nation is now looking to diversify its economy to reduce over-dependence on oil and gas exports for national income. Last October, Bruneian Minister of Energy and Industry, Mohammad Yasmin Umar, reiterated his country’s commitment towards ensuring sustainable energy development during the United Nations Climate Change Conference in Bonn, Germany. This move comes at a time when the global outlook on fossil fuel derived energy is overwhelmingly negative due to its adverse effects on the environment. The first milestone set by the Bruneian government as it tests the waters of renewable energy is to diversify its power generation mix. 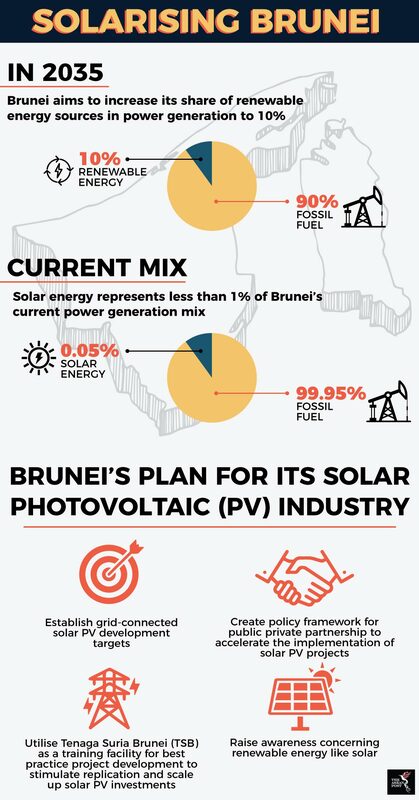 Latest data from the International Energy Agency (IEA) show that 99.95 percent of Brunei’s electricity is sourced from fossil fuels. The remainder 0.05 percent comes from solar energy. Brunei aims to boost these numbers and attain 10 percent or 954 gigawatt (GW) of renewable energy in its power generation mix by 2035. The reasons for going the way of renewables are well known; it is environmentally friendly and according to the International Renewable Energy Association (IRENA), it is fast becoming more cost effective than traditional energy resources. Take solar energy, the most developed renewable energy source in Brunei, for example. Sunshine in Southeast Asia is not in short supply. According to projections by IRENA, on average, the region’s irradiance rate is between 1,500 to 2,000 kWh per square metre annually, which permits capacity factors north of 20 percent. Besides that, the reduction in cost of solar photovoltaic (PV) cells has made solar energy a more competitive alternative to fossil fuel sources. Data by the ASEAN Centre for Energy (ACE) show that the average levelised cost of electricity (LCOE) of solar PV projects is at 22 cents per kWh – although in Southeast Asia, the costs could be lower thanks to a higher irradiance rate. From an environmental perspective, solar is most definitely less harmful to the environment than other fossil fuel powered power plants. According to Patrick Jaeger, Vice President Development Asia-Pacific at Conergy, solar energy can be up to 40 times less emissive when compared to fossil fuel energy. A good measure to stake this claim on is to compare the “life cycle C02 equivalent” between both power generation types. The measure considers the value of the average amount of CO2 emissions per generated kWh based on the lifetime of the power plant. The Intergovernmental Panel on Climate Change reported that coal power generation has approximately 740 to 910 grams of C02 equivalents per generated kilowatt hour (gCO2eq/kWh). On the other hand, solar PV for utility scale projects has between 18 to 180 gCO2eq/kWh. “The realisable potential for solar in Southeast Asia cannot be understated. Strong economic growth, relatively high costs of electricity, shortage of traditional sources, undeveloped infrastructure, strong year on year increase in power demand, rapidly declining solar panel prices and a lot of sunshine,” explained Jaeger when he summed up his thoughts in an email response to The ASEAN Post. A step in the right direction are plans for the development of Temburong – the easternmost district in Brunei – as a smart city. It is also the home of Brunei’s only solar farm that has been in operation since 2010. The Temburong Smart City project is in collaboration with the Economic Research Institute of ASEAN (ERIA) and is made up of two phases. The first phase would introduce energy efficiency technology on existing infrastructures like buildings and roads as well as smart grid technologies. The subsequent phase would use a computer simulation to determine the suitable capacity of power sources to provide electricity to the district. The main challenge faced by the sultanate’s development of renewable power generation is cost. Those living in Brunei enjoy one of the lowest electricity costs in the region because of the country’s rich hydrocarbon reserves that is used to generate electricity in its thermal power plants. This doesn’t incentivise people to install solar panels of their own because grid parity has yet to be reached. The cost of renewable energy is said to have reached grid parity if it can generate power at an equal or lower cost than when power is obtained from the national grid. Besides that, the government, while focussing on renewables, is placing more importance on natural gas as a “cleaner” alternative to other hydrocarbon-based sources for power generation. The latest white paper on energy released by the Energy Department of Brunei reveals that the frantic pace of growth will lead to a skyrocketing demand for energy that can only be met quickly via fossil fuels. “This creates many opportunities for an oil and gas producing nation like Brunei Darussalam. With our impeccable credentials of reliability and safety, our long positive track record of partnership with key consuming nations and being in the heart of Southeast Asia, Brunei Darussalam is in a favourable position to continue as a leading upstream producer, particularly natural gas, and growing the downstream industry,” the report stated. Brunei is in a lopsided limbo in terms of energy diversification – leaning greatly towards fossil fuels rather than renewables. Nevertheless, the government’s efforts to go green, starting with power generation cannot be understated. It is the first step, in what hopefully is a fruitful renewable energy endeavour for the hydrocarbon-dependent sultanate.